Is Belgium's golden generation now ready? Belgium - is 2018 their year? 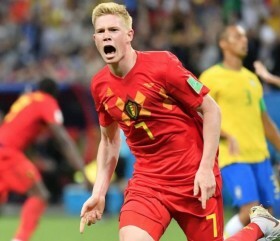 Another victory for Belgium against Brazil in the World Cup signalled the country's unbeaten tournament so far. Is this finally Belgium's time to shine? Labelled the "Golden Generation", Belgium have been able to call upon some of the world's best players and 2018 is the year that many of these players are coming into the prime of their career. In a recent Belgium game, as many as 9 of the players on the pitch were playing in the Premier League. The defence of Belgium - the trio of Vincent Kompany, Toby Alderweireld and Jan Vertonghen - continues to impress. The combative midfield pair of Axel Witsel and Marouane Fellaini shuts out the most talented of creative playmakers. The midfield through to attack, primed with Romelu Lukaku, Eden Hazard and Kevin De Bruyne, arguably one of the best forward lines to have been assembled in any World Cup tournament. As far back as 8 years ago, many pundits tipped Belgium for the top in a World Cup tournament and it appears that this could finally be their time. An impressive 2-1 win over Brazil yesterday evening has proved that the country has the ability to win against the top sides. That wasn't quite the same story in Brazil 2014, when Belgium went home early after a series of sub-par performances. What's most impressive about Belgium, is the fact that even on the bench they have an array of talent. Leander Dendoncker pulls the strings at the heart of Anderlecht's midfield, Thomas Meunier is a first team regular at Paris St Germain; Yannick Carrasco is one of Belgium's best up and coming talents. Then we of course can't forget the likes of Youri Tielemans and Adnan Januzaj; both of whom will be full internationals for the next decade for Belgium. Even when it comes to experience, Belgium has it; Mousa Dembele and Dries Mertens can be called upon at any time necessary. Even outside of the World Cup squad, spare a thought for Christian Benteke, Radja Nainggolan, Steven Defour, Divock Origi and Kevin Mirallas, all players who haven't been able to even make the World Cup squad for the tournament in Russia. Next up for Belgium, in the semi-finals is a mouthwatering tie against neighbours France. Arguably the two most talented squads in Europe, this game is sure to be one of the World Cup's most exciting and tense. If Belgium can turn over France, they will rightly be installed as the new favourites to go on and win the whole tournament.